Upon closer inspection, Jo and Simmons’ claims appear to be based on shaky methods. The ICC’s deterrent effect, if any, is far smaller than they suggest in their working paper and in high-profile briefings to prominent activists. Jo and Simmons argue that a state’s ratification of the ICC’s Rome treaty reduces, on average by 60%, the number of its intentional killings of civilians in military confrontations. They analyze conflicts that took place between 1989 and 2011 to see whether there has been a marked change since 1999 when the Rome Statute was negotiated and states began to ratify this treaty. They also claim that when joining the ICC is associated with domestic legal changes to conform to ICC rules, killings also decline by 60%, and that social pressure in ICC ratifiers, measured by the presence of rights organizations, also reduces killings. Atrocities by rebel groups are not affected by ICC ratification or domestic legal changes. But Jo and Simmons claim that “ICC actions”—which they measure globally rather than by country—impress rebels enough to reduce their intentional civilian killings by 30%. At first glance, this sounds impressive. The catch, though, is that repressive regimes that thought they might need to resort to atrocities to survive have had an incentive not to sign the treaty, while states that do ratify the Rome Statute might logically be those that had no intention to commit atrocities. If so, it makes little sense to say that the ICC “deterred” these signers. Most of the states that perpetrated large-scale atrocities in the relevant period (such as Libya, Sri Lanka, Sudan, and Syria) have not joined the ICC. Contrary to Jo and Simmons’ research design, it is the non-signers that most need to be deterred. Most of the states that perpetrated large-scale atrocities in the relevant period (such as Libya, Sri Lanka, Sudan, and Syria) have not joined the ICC. Even so, under the Rome Statute, these states can be referred to the ICC by the UN Security Council, which means that even in non-member states, the ICC still has a deterrent potential. After all, Libya and Sudan did come under the ICC’s jurisdiction as the result of a referral, but in both these cases, deterrence has failed. Jo and Simmons’ method leaves their positive findings unaffected by these failures. Although they count ICC investigations and indictments in these cases as part of their global measure of “ICC actions” that should lead to deterrence, since these states are not ICC members, deterrence failures there do not count against their basic claim that ratification prevents atrocities. Their treatment of ratifying states is also problematic. Simmons accepts that some states had no intention of committing atrocities, but says that others had previously committed intentional civilian killings and therefore it is reasonable to believe they might do so again. In an earlier study, she suggests that states of this kind likely joined the ICC after a political transition of some kind, using the ICC to “tie their hands” and keep to the straight and narrow. If so, however, it seems a stretch to assume that the ICC “deterred” these states; at best, one could argue that the court helped prevent them from backsliding. In fact, Jo and Simmons acknowledge that in many of the ratifying cases included in their sample, civilian killings declined in the year or so before ICC ratification. A third and related possibility is that signatory states may believe their own crimes will be minimal when compared to those of their opponents. For this reason, the regime may think it can enlist the ICC to prosecute rebels with the state’s help, and leave state leaders alone. Whereas states choose whether to join the ICC, rebel groups, by contrast, come under the jurisdiction of the ICC involuntarily, when the states on whose territory they operate sign the treaty. The ICC creates an incentive to ratify for states that don’t need to be deterred, especially when they are confronted by rebels that do. It is no wonder, then, that the ICC seems to “deter” states well, but rebels more poorly. The ICC has unwittingly reinforced these incentives through prosecutorial strategies that have issued arrest warrants solely against rebels in DRC, Cote d'Ivoire, Uganda, and the Central African Republic. Jo and Simmons are aware that their argument is seriously undermined if only easy-to-deter states ratify the ICC. They try to deal with this problem by comparing ratifying and non-ratifying countries to see if they are similar in ways that might affect the likelihood that they will commit atrocities. These include regime type (more authoritarian regimes might be more abusive), the presence of peacekeepers, and having recently been in a war. This kind of statistical matching is a blunt instrument, however, and cannot identify those factors most likely to affect the decisions of authoritarian governments to ratify. For example, does the regime believe it has the opposition under control, in which case no atrocities are necessary? Or, perhaps, is the opposition getting stronger, leading rulers to anticipate the use of brutal repression? Nor can this statistical technique reveal whether a government thinks that joining the ICC will help enlist the international community in the struggle against rebels that commit atrocities, as Uganda’s did. Jo and Simmons do not offer detailed case studies to show how deterrence works, though they do claim that Uganda, Kenya, and Congo are examples of success. Their claim that ICC indictments deterred atrocities by Joseph Kony’s Lord’s Resistance Army in Uganda is particularly dubious. LRA mayhem dipped shortly after the indictments because of military defeats and the loss of foreign support and a safe haven in Sudan. But their vicious ways soon resumed when they regrouped in the Congo. Moreover, the whole episode illustrates how states can play the ICC. Many researchers suspect that the Ugandan regime, which itself committed horrendous atrocities in its northern districts and in the Congo, cut a deal to request ICC action against the LRA in return for de-facto ICC immunity. 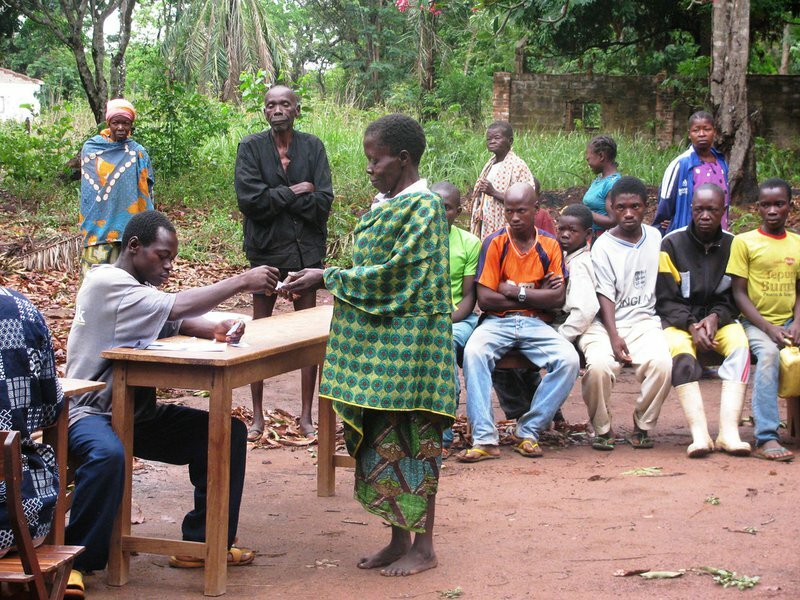 Congolese refugees, displaced by the violence of the LRA, receive food coupons in Zemio, CAR. In Kenya, which Jo and Simmons claim as a case of successful deterrence, election-related mass killings shortly followed the country’s joining the ICC. Domestic investigations were slowly suffocated. When the ICC made good on its implied threat to prosecute Kenya’s sitting president Uhuru Kenyatta, the bribing and murder of key witnesses left the ICC with no recourse but to halt proceedings. Kenyatta gained political leverage by running against the “imperialism” of the ICC, a platform that united former enemies, and as Jo and Simmons note, this unity may explain much reduced electoral violence. If this is a success case, it is not one that illustrates the mechanisms they highlight. Congo also offers only partial support for the claims Jo and Simmons make. Abusive states are harder to deter with threats of international legal action than Jo and Simmons suggest. These regimes’ more likely response to such pressure is either to mobilize a backlash against the court or to try to fake compliance. States whose power depends on abusive methods often respond to international pressures with a phony show of legal accountability, putting some minor perpetrators on trial, giving them light sentences, or forming a “truth commission.” Sudan adopted a range of toothless measures to demonstrate compliance with human rights. Even states outside the ICC framework have adopted this strategy. Sri Lanka’s Lessons Learnt and Reconciliation Commission found that only the regime’s opponents committed crimes. In the rough-and-tumble world where mass atrocities are likely to occur, regimes and rebels often have blood on their hands. Spoilers often have the motive and the opportunity to use their clout to wreck political and legal reform, and thus evade legal accountability. In strategizing effective ways to contain such menaces, the role of law must be placed realistically in its political context. Reducing atrocities and advancing accountability depends first on the construction of a powerful coalition based on bargaining among legal reformers, opportunists, and fence-sitters. In this law does not lead, it follows. How this bargaining unfolds, and whether it must include explicit or implicit amnesties, depends crucially on the power of spoilers and whether they can be reconciled to a reformed political order. An amnesty that includes no strategy for containing spoilers will be as ineffective as a threat of trial that provokes rather than constrains. For every Yemen with an ineffective amnesty, there is a Sudan with a counterproductive indictment. These processes of political bargaining and coalition-making, more than processes of law, are crucial to understanding the still-unfolding cases in Kenya, Sri Lanka, and Uganda, just as they were central to earlier success cases based on amnesties in South Africa, El Salvador, and Mozambique. The overall lesson from the vast bulk of empirical research on transitional justice and the ICC is the centrality of politics. Those who are trying to understand how to leverage the ICC to reduce the likelihood of atrocities should start by understanding its political context, not by counting on some unproven, highly speculative global deterrent effect of international law.